Book your holiday in Santa Fe! People tend to think of visiting Santa Fe during the summer, but let us tell you a secret – the holiday season is the best time to visit. The crisp, cool air; the big, fluffy snowflakes; the bright, warm sun set the scene for the most magical holiday season you’ll ever experience. The rich Spanish & Mexican history, combined with the spiritual Native American traditions create a festive atmosphere unlike anywhere else in the world. Ski Santa Fe – Only 16 miles away from downtown Santa Fe, Ski Santa Fe is a great place to get on the mountain! Sitting on the edge of the Santa Fe National Forest, Ski Santa Fe has packages for every level of skier, starting with their “Never-ever” package which includes lessons, lift ticket and rentals for under $100! Christmas at the Palace – A family favorite, free event held at the Palace of the Governors – the oldest continuously used public building in the United States! Christmas at the Palace is a day filled with food, crafts, piñatas, live music and an unforgettable visit from Mr. & Mrs. Claus. Celebrating their 30th year this year on December 12. 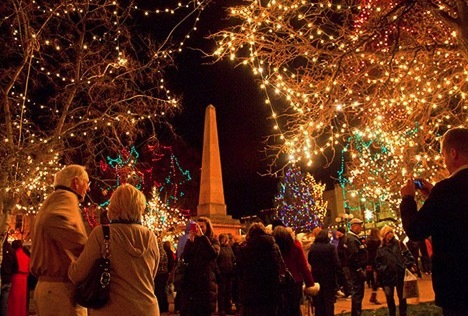 Santa Fe Farolito Walk – A Santa Fe Christmas Eve tradition, the Farolito walk is enough to make you want to come to Santa Fe on its own! Farolitos (sometimes called Luminarias) are unique to the Southwest – coming from Spanish merchants hundreds of years ago, they have been a staple Christmas decoration throughout the ages. This free, all-day event picks up at dusk with dozens of stores, galleries, and restaurants along Canyon Road hosting special hours to celebrate. This is a sight not to be missed! But most importantly, when you’re done experiencing all of what Santa Fe has to offer, you’ll be able to return to your cozy furnished vacation rental and it’ll feel like you’re coming home! We’ll even let Santa know you’re coming! This entry was posted in Holiday Rentals, Santa Fe Attractions, Winter Rentals and tagged christmas, Christmas Vacation, farolito, holiday rental, holiday season, holidays, nutcracker, santa fe holiday, vacation. Bookmark the permalink.